KitaMika has a childlike quality that belies the idea that you are speaking to a young mother-to-be in her early thirties. This wandering soul has found her footing as an artist and she pours her very being into her art. Her art is an expression of pure emotion that her subconscious captures with a comprehensive intellect. The young Japanese artist has a tortured past that fuels her creativity. 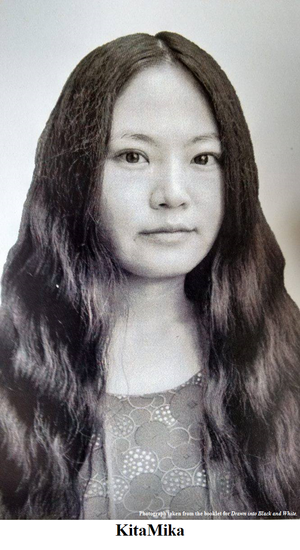 Her mother was institutionalised with paranoia when KitaMika was a child and, at the age of eight, KitaMika saw her father divorce her mother. She lost her father to suicide after his second marriage. KitaMika’s relationship with her stepmother was a tumultuous one and she was brought up mostly by her grandparents. At the age of nineteen KitaMika made her first trip to India and she has been a regular visitor from 2003. It is her love of religion and culture that has set her travelling to different countries. ‘I have travelled all over Asia and Africa but I always find myself back in India,’ says KitaMika, showing off a tattoo of Parvati on the nape of her neck, expressing her fascination with Hindu mythology. India for her, and especially Goa with its beautiful natural environment, has provided a safe haven. Her love for art is a childhood one but it was discouraged by her parents and her teachers. To them it was not a worthwhile and lucrative interest. Instead, KitMika explored her artistic side through photography, earning a degree in the field. It is only in the last two to three years that she has taken up art again. In the throes of electronic music at a party she felt her mind being set free and the desire to draw returned. The core of her exhibition Drawn into Black and White, which is showing at the Cube Gallery at Moira, Goa, is the nine drawings that depict the various stages of her pregnancy. There seem to be images within images in her drawings that are reflective of a tribal context. She uses black ink which is definitive of Japanese art and tells her own story and her struggle to find family and solace through the drawings. On occasion she uses other colours such as red and yellow, but black and white images for her are the most representative of her innermost emotions. 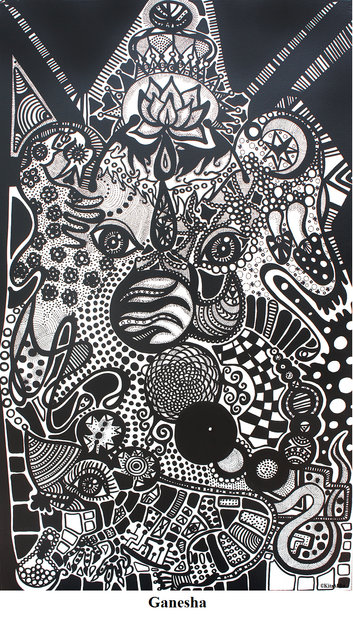 She creates patterns with repetitive dots, circles, cellular forms, and cosmic, nature and electronic impressions. These in turn give rise to images of birds, fish, snakes and horses, which are predominantly present in her drawings besides other animals. These animals symbolise the four elements. There are self-portraits, Indian Gods, the Third Eye, a protecting hand and the developing baby within her that become clearer to the eye upon closer scrutiny. Curator Katharina Domscheit met KitaMika through the director of the Cube Gallery, Sonny Singh. ‘My technique develops through feeling in different settings. I seek self-satisfaction from paintings rather than appreciation from others’, says KitaMika, who incorporates her perception of people, energies and nature into her drawings. With her candour, KitaMita is able to go beyond superficiality to read people as they are and has no fear of revealing herself and her troubled past. This honesty contributes to the impact her drawings make. Birds are a significantly common figure one sees in the drawings. This is because birds speak a universally understood language of music, a language that is pleasing to KitaMika. Humans lose coherence through the use of words: saying one thing and meaning another. Her free spirit is aptly signified by the bird and as the bird is a family oriented species it appeals to her desire for a stable family life filled with affection. Katharina comments, ‘Having a baby is a powerful experience. It forces you to look into the past and connect with your family.’ She goes on to ask KitaMika if she will visit her biological mother after the baby is born, to which KitaMika nods in the affirmative. Through her drawings and the love of her baby, it is hoped that this young artist will finally have the experience of a happy family life. Drawn into Black and White will continue showing at the Cube Gallery, Moira, Goa, till 6th December, 2015. The Cube Gallery is open from Wednesday to Sunday, 11:00 am to 6:00 pm.